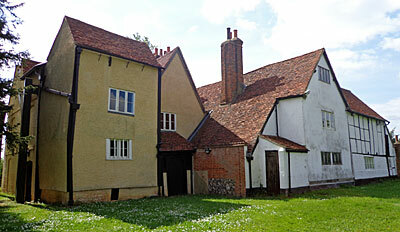 The oldest timber-framed building in London, well, Middlesex, is hidden away in North Harrow. More than that, it's not anywhere central, but up a residential street in the middle of a recreation ground. More than that, it's not the tithe barn straight ahead with Harrow Museum inside, that's only the aperitif. Try the cottagey-looking place across the moat - oh yes, it's got a moat - beyond the securely locked gate. That's Headstone Manor, parts of which date back to 1310 and haven't fallen over yet. And on weekends in spring and summer, if you turn up at 3pm, you can take a look inside. To find your tour guide, start in the tithe barn. You can have a look at the exhibition if you like, currently a celebration of all things Harrow-on-the-Hill, although that may not take you very long. Or wander over to the cafe counter where they serve cups of tea and general sustenance to users of the surrounding football/cricket pitches. It's not the most engaging museum in London, to be fair, although there are plans to change that, of which more later. Instead just revel in the fact you're standing beneath a 500 year-old beamed roof, in a space which (following renovation in 2014) will become the council's newest event/wedding venue. £3.30, thank you, step this way. The moat keeps most unwanted visitors out, and the padlock on the gate does the rest. They don't allow the public onto the island without supervision, let alone inside the house because it's not entirely stable. Two great jacks embedded in the lawn help to support the oldest part of the house, while the other end isn't quite as ancient as that. Headstone Manor was built as a residence for the Archbishop of Canterbury, somewhere to stay to the northwest of London when the King was holding court nearby. His lodgings were on the south lawn - ground radar has been used to trace the foundations - but are long gone now. 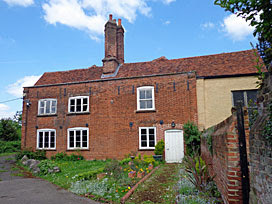 From here you can see how the manor evolved considerably over the centuries, first an extension built after Henry VIII sold the place to a favourite, then a brick farmhouse-style end from the 1770s. Headstone Manor is a complete history lesson in one building. Inside too, once the tour guide's unset the alarm, is just as much of a mishmash. In the heart of the building, under the stairs, is a medieval food store with a wine cellar extension. The bedrooms upstairs have peeling floral wallpaper from when this was still a private residence, right up to the 1980s. And the Great Hall isn't so great any more, after 80% was sliced off leaving only a sliver. A century ago this former ecclesiastical dining space was being used as a farmhouse kitchen, and several tweaks they made to the walls didn't really enhance the building's legacy. But the lofty beamed roof is an unlikely treat, and the room does still have a splendidly practical tiled floor. But watch your step. Various rooms are taped off because the floor is unstable and at risk of collapse. Behind the front door all the floorboards have had to come up because English Heritage insisted on not laying an anachronistic damp course, and now the damp has proven them wrong. It's going to take another lottery grant to bring this building back to life, which could take several more years, but then the plan is to move Harrow Museum in here and use the space for displays. It'd certainly be a special place to visit, with a warren of rooms and back staircases to explore. In the meantime these weekend tours are the only way to cross to the island and take a look inside this medieval survivor, and that comes recommended.